By now I think you're aware of the fact that Blogger doesn't support redirection to external sites, even if said sites are running on Blogger. Instead, Blogger only supports redirection within the domain, be it a hosted domain (BlogSpot) or a custom domain. The redirects can be set by going to Settings > Search Preferences > Custom Redirects and can be marked as either permanent (301-redirect) or as temporary otherwise known as a soft-redirect (302-redirect). Blogger doesn't support redirection to external websites for good reasons. The major concern prompting that decision is that such redirection is merely going to be abused by spammers and attackers despite it being a useful resource for webmasters with legitimate needs for it. That's the situation I got myself in two months ago after I started another blog. A couple of posts I had published on this blog looked rather misplaced with rest of the content I have here and so I thought it would be a good idea to move them to that blog where they would be more relevant to the audience I was targeting. Now here's the problem: a couple of these posts were doing well traffic wise since they were ranking rather high in Google search results. As per Google recommendations, a 301-redirection is the most ideal solution for these posts as it would retain the ranking not to mention take care of any internal or external links emanating from other websites. Delete the posts so that they return a 404 then use the Remove URL tool in Search Console to remove them from Google Search Results. After a while I would then republish the content on my new blog and start the arduous task of getting them to rank as before. Redirect the posts to a page containing links to their new location then hope against all odds that the readers are going to follow the links. Use the meta-refresh tag to redirect. It comes at the cost of user experience: looks spammy as the visitor will for a couple seconds view the site before being redirected. Some old browsers may not work well with meta-refresh resulting with users not being able to use the back button or creating infinite loops. Search engines may flag your site as spammy if you use a lot of meta-refreshes. 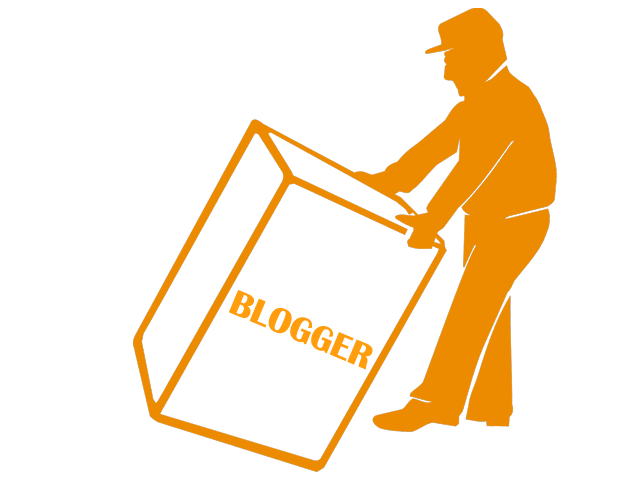 Guides online on the subject of implementing the meta-refresh on Blogger indicate that it has to be implemented in the template itself. This may not be practical when redirecting a lot of posts (will inflate the size of template). A site-wide redirection seems better suited for its use. There is the risk of being flagged for duplicate content as the content in the two domains is similar. Google may fill in the blanks and assume you're trying to manipulate their ranking resulting in either the site dropping in rank or even being removed entirely from their index. The bright side in all these is that fortunately Google does process the meta-refresh tag as a redirect. They however don't recommend it because of its poor user experience and processing time. Nevertheless, it does work. The duplicate content issue presents the biggest challenge here and Google cautions against it. To avoid it one may use the no-index tag on the original URL (tells Googlebots not to index that page) but that would inadvertently make the redirection useless for the purpose of retaining the ranking. Other than using the no-index tag Google suggests using Canonicalization if the duplicate content is unavoidable or is there for legitimate reasons. Canonicalization tells Google which of the pages that have duplicate content is the authoritative version, i.e. the canonical version. If not told explicitly, Googlebot decides and indexes the URL it deems to be the most ideal according to a number of factors such as the type of traffic and makes that URL the canonical version (e.g. mobile and desktop versions). That's explains why in the case of Blogger you may sometimes notice that Google has chosen to index either the mobile (www.example/2018/07/post-url.html?m=1) or desktop (www.example/2018/07/post-url.html?m=0) URL of a post instead of the one published/in your sitemap (www.example/2018/07/post-url.html). If a canonical URL is explicitly specified (e.g using the rel=canonical tag), Google may index it and exclude the other duplicate URLs from the results. We can therefore use canonicalization to indicate to Google that the new URL to which we're redirecting to using the meta-refresh is the canonical one. Eventually the original URL will be dropped from the index and the new URL will take its rank. For canonicalization to work, both URLs should retain similar or almost similar content. If you must edit the content in the new URL, let it be minimal but let it retain the original subject matter. Our redirect will therefore have to use these two tags in tandem. The rel=canonical tag will specify that the URL being redirected by the meta-refresh tag is the canonical one. To do that easily, we'll use Insider Zone's cross-browser client side URL redirection generator tool. I came across this tool after I had long given up on this whole redirection plan courtesy of this answer that I stumbled on StackOverflow. I suggest you check the answers in that question for a more varied take on the meta-refresh redirect. The code ideally should be put immediately after the head tag, that is on the template, but that would defeat the purpose since we need to redirect individual posts and not the homepage. Fortunately as I found out, the code does work with posts too. 1. Go to the insider zone site here, enter the URL you're redirecting to in the external domain and hit the generate code button. document.write("redirecting..."); // Don't remove this line or appendChild() will fail because it is called before document.onload to make the redirect as fast as possible. Nobody will see this text, it is only a tech fix. 3. Paste that code at the very top of the post and save the post. Doing the above is enough, but it may take Google a while before it crawls your site to notice the redirection and the new canonical URL. Posts receiving good traffic do seem though to get updated pretty quick to the new URL. Also since this is Blogger, Google may have indexed more than one version of your URL (the mobile and desktop variants) and therefore it may have to be signalled that they too redirect to the new canonical URL, though with time it will notice on its own and update them accordingly. (I had ignored this initially only to later wonder why the redirected post was still showing in the results). You use Search Console and have added properties for both sites. The site with original URL however is what we require, but it's good to have all you sites there if you want to monitor their search presence. That the original URL is already indexed by Google. 1. Start by finding out which URL variant of your post Google has selected as the canonical one. Go to the new search console and inspect the post URL by searching for it in the bar at the top of the page. Google will retun it's index status and some other data. Repeat this for the mobile and desktop URL variants and note if they're indexed as well. Go to Google and search some keywords that will bring up the post then observe the URL. You can also do a site only search as follows: site: www.yoursiteurl.com "post keywords"
3. Enter the URL of the page you're redirecting and click the FETCH AND RENDER button. 4. The fetch and render should return the status as Redirected. If you use FETCH, the redirection won't be detected and will return a Complete status instead of Redirected. This is because our redirect is not a HTTP one (301/302). 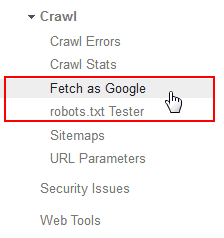 For Googlebot to see the meta-refresh redirect it has to parse the page and that's why we're using the FETCH AND RENDER option instead. 4. To confirm that the page has redirected to the intended destination, click to open the result. You should find the external URL that you used to generate the redirect code as the destination. Now just click the Request indexing button. 5. Doing that will launch a window for you to select the method of re-crawling. 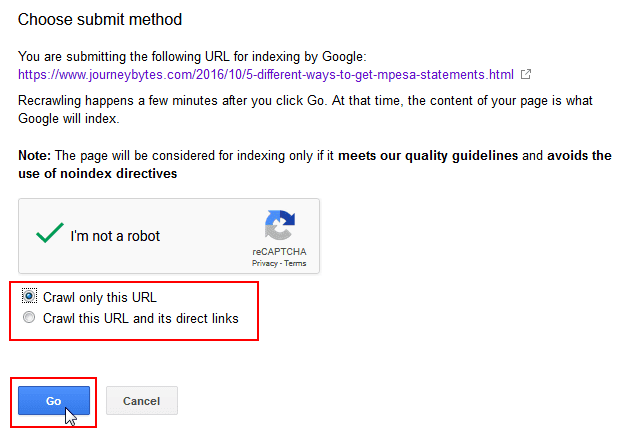 You get two options here: Googlebot can either recrawl the submitted URL only or along with the direct links in that post's URL. You'll have to complete the Recaptcha challenge for every request before you can do the submission. For the purpose of redirecting, the crawling the URL only option will suffice. However you may consider using the second option if for instance the post has updated internal links for posts that you've since redirected. Google mentions that there's quota on how many individual URLs you can submit for indexing per day though they doesn't explicitly mention how many. However, on the Fetch as Google help page the daily quota for the number of fetches that can be done is listed as 10. I take it that means also the quota for individual URL submissions is also ten, though I can't confirm this and whether this also applies to the crawl direct links option. What I've noticed though is that the Recaptcha challenge appears on the Fetch page when I reach the 9th request. I presume that's a "warning". 6. Now repeat the above for the mobile or desktop URL variants if you established that one of them has been indexed too. Now all that's left is to wait. It will take Google from a few days to a week to update their index as it was in my case (posts with good traffic seem to update much quicker). 1. Go to the New Search Console and select the property with the redirected URL. 2. In the search box at the top, enter the redirected URL and press the Enter key. If Google has not yet updated the index, you'll get the status that the URL is still in Google. In that case, just wait a few more days. If the index has been updated you'll get the status that the URL is no longer in Google, exactly what we want. Just below this you'll find the Index Coverage summary. You'll notice the reason given for this status is that the Submitted URL (our original URL still in the sitemap) is NOT selected as the Canonical URL. Our destination URL which we declared as the canonical version will instead be selected as the canonical one by Google. The URL won’t get the ranking of the old URL, at least not immediately though again I can't confirm on this behaviour. I also noticed the old URL in some cases still showed up in search results along with the new URL for a couple days before disappearing completely. During this "transition period" the old URL ranked higher than the new URL. It's not until the old URL disappeared completely that the new URL started ranking higher. The whole process took about a 1-2 weeks depending on the post in question. If you notice the old URL is still showing up in the search results long after search console has indicated it has selected your URL as the canonical one, then it's likely you had multiple URLs in the index. Open that result and verify the URL. It could be the mobile or desktop variant in which case you'll have to repeat the re-indexing for it. I learnt this the hard way. Remember one of the downsides of using the meta-refresh is that the site comes across as spammy. This is inevitable but I suppose its impact can be reduced if things are done in a systematic way. My approach up until now has been to take the whole process slow. Instead of doing the redirects in one go for all the posts I intend to move, I’ve been redirecting on average one post per week. Quite low I know, but that’s only because I’m redirecting in total about 30 pages. 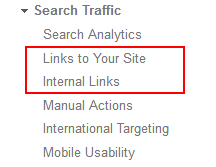 To figure out the internal and external links to a given URL, go to Search Console > Search Traffic then choose Internal Links or Links to Your Site for external links. The latter has no URL search function but you can use the Ctrl+F option in your browser to manually search the URL. Updating the internal links in your blog should be easy, it's the external links originating form external sites that pose the biggest challenge here. I suppose the only thing you can do here is contact the site owners and tell them to update to the new links. Kelvin is a writer and registered nutritionist based in Nairobi. Passionate about writing and helping people solve problems, he's been actively blogging since 2014 on tech, nutrition and "pseudo poetry". What are Highlighted Comments in YouTube? What is the Private Folder inside WhatsApp Media Folders?